The poster session and awards ceremony has now become a regular feature of WindEurope events. During this special session, all poster presenters will be present in the poster areas to meet other delegates and answer any questions about their work. 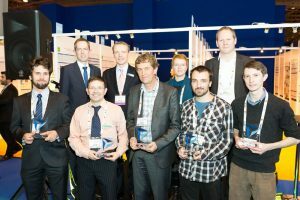 The best posters under each topic will also be distinguished, and the winners – who will be awarded a trophy and a free pass for the WindEurope event of their choice in 2017 – will be announced by Dr Stephan Barth, Managing Director of Forwind, on behalf of the European Academy of Wind Energy. Come and mingle with the poster authors and other conference delegates in a relaxed setting. Though you can visit the poster area at any time during the conference, this is your chance to meet face to face with the presenters with no queuing required.